RBSE 10th Time Table 2019: Rajasthan Board of Secondary Education (RBSE) has released the Rajasthan Secondary School (10th Class) time table 2019 at rajeduboard.rajasthan.gov.in. Students those who are waiting for RBSE Class 10th time table 2019 can check from the RBSE Official website. As per the time table/ Date sheet Rajasthan Board 10th class exams will be held from 14th March to 27th March, 2019 and the results are going to be release in the month of May. Here we shall update the accurate information regarding Rajasthan 10th exam and result dates. Candidates can keep visiting our site for latest information regarding Rajasthan 10th date sheet, admit card release dates and other information. Rajasthan Board of Secondary Education (RBSE) is one of the oldest education boards established in India. The RBSE/BSER was established in the year of 1957. The head office of RBSE was situated in Ajnir, Rajasthan. The RBSE is having more than 6000 schools and colleges working under its affiliation in 32 districts across the state. The BSER offers secondary and senior secondary education for the students. Annually a huge number of students are getting their certification from this board. The BSER conducts the annual examinations in March/April months and releases the results in May month. Students pursuing under the Rajasthan Board can keep visiting the Rajasthan Board official website, rajeduboard.rajasthan.gov.in for latest updates. The Rajasthan Board has organized the class X Examinations from 15th March to 26th March in morning session from 8.30 am to 11.45 am. While the RBSE Class 10th Date sheet was released in the month of January, 2018. This year also the examination scenario will be almost similar to the last year. Hence students pursuing under RBSE can get ready to attend the examinations with planned preparation. Students can shortly check the details of examination dates, admit card release date, and other details. Stay tuned! 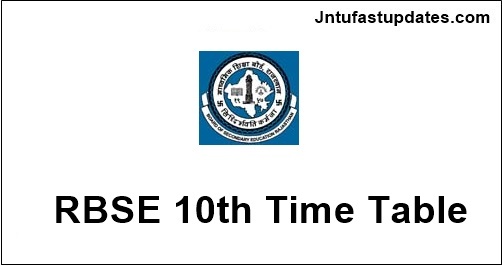 On the homepage, RBSE 10th Exam Time Table 2019 Link appears; Click on the Link.